Gathering My Roses: OIKOS YOGURT: Review and Giveaway! OIKOS YOGURT: Review and Giveaway! Stonyfield Farm's OIKOS Greek yogurt is an amazing yogurt. It's made from the freshest ingredients and you can taste the love and dedication that goes into making it. I just recently tried (and became hooked) on OIKOS Greek Yogurt. The flavour is crisp -- not too sweet like some yogurts and has a neat hint of sharpness. It's very satisfying. I admit, the blueberry is my favourite. Stirring the fruit throughout the yogurt turns it a lovely shade of bluish-purple. The fruit is tart and creamy. Oh, Yum! OIKOS Greek Yogurt is very different from the regular cultured yogurt we're used to eating. It has an incredibly rich, creamy texture with about twice the protein of regular yogurt, less lactose, and fewer carbs. It's filling and lasts a long time! From the website: "We make our authentic Greek yogurt with a centuries-old straining method that removes the whey (liquid) from the yogurt. Called yiaourti in Greece, Greek yogurt is thicker and creamier than regular yogurt, and its production requires about three times the milk used to make regular yogurt. We use fresh, delicious organic milk from family farms. Our organic fruits are hand-picked for the highest quality and prepared the same day to retain the freshest flavor. And we use five live active cultures: S. thermophilus, L. bulgaricus, L. acidophilus, Bifidus, and L. casei." OIKOS comes in five delicious flavours: Plain, Strawberry, Vanilla, Honey, and Blueberry. It's available in 5.3 oz. cups and also in 4 oz. 4-packs! 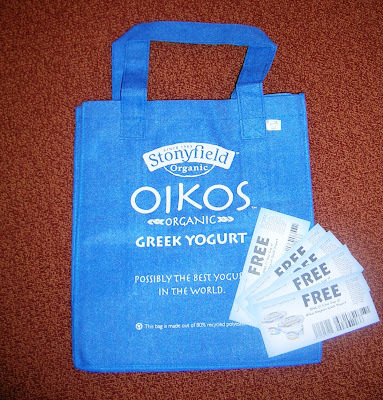 The wonderful folks at Stonyfield have generously offered one of my readers a chance to sample OIKOS by giving away an Oikos tote, 1 free 16 oz. coupon and 4 free 5.3 oz coupons. 4. Post about this contest on your blog! The contest is open until Monday night and I'll draw a winner on Tuesday! Good luck! How awesome! I've actually never tried Greek Yogurt, being kind of a picky eater. The way you describe it though, it could be just what I'm looking for to kick the food blahs I've been having! I'll enter. I have looked at this in the store but have not tried it yet. I've tried Greek yogurt, but not the Oikos brand. I love the way it's thicker than the usual yogurt. Thank you for the chance to win! I would love to try the Greek yogurt - I have yogurt for breakfast every day - please enter me! I tried it once and it was good but it cost way to much! Enter me please! I love Greek yogurt, and I'm always on the lookout for the perfect brand. I do a lot of cooking with yogurt, and the Greek style seems to work better than others much of the time. Mmmm... I'd love to try it because it sounds great! Count me in!